You might have noticed that AnaJan, over at Stepalica, has a new pattern for sale today. If you haven't I suggest you go take a look. As a rule I don't do skirt patterns, but this is different. It has some really nice design features that sparked my interest and when I had the chance to be a pattern tester I jumped at the opportunity. 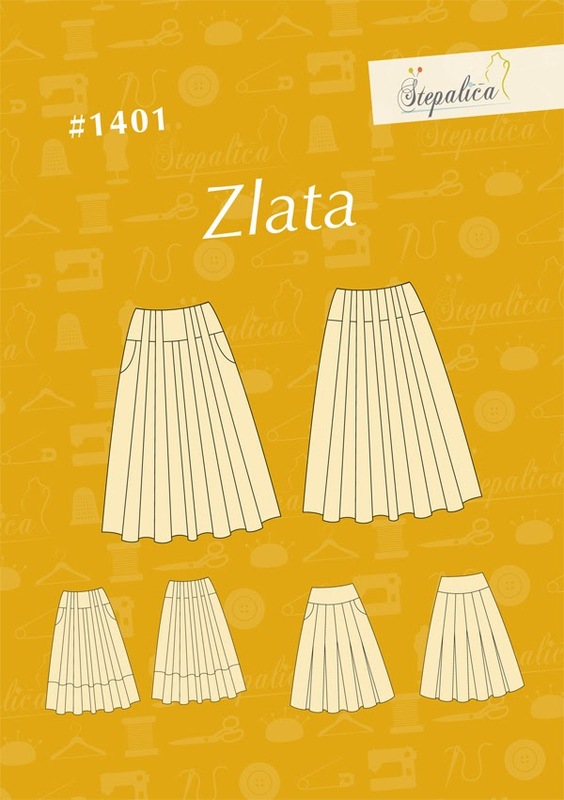 The Skirt has pleats and variations A and B have belt loops that are formed by the pleats. I've never seen this design feature before and it makes the styling unique. I made version B with a contrast waistband and panel at the bottom of the skirt. The pattern is very well drafted and all the seams were well matched, much better than some of the big 4 in my opinion. The instructions were easy to follow for someone with a little sewing knowledge. I thought the skirt would be tricky to construct, but it was very simple. I wanted to create something that I would wear throughout the spring and summer, so I chose some lightweight cotton curtain fabric from Terry's Fabrics and some red cotton gaberdine from my stash. I chose these fabrics as they would hold the pleats well over time. the skirt is lined in cotton and has an invisible zip at the side. The only alteration I made was to shorten the hem by about 2 inches. I wanted the skirt to hit just above the knee. I made the skirt up in a size 38. I am pear shaped and often have to grade up at the hip, not on this pattern. the fit on the hip was spot on, if anything I'd take the waist in a little more next time. AnaJan recommends using fabrics with some body that will hold pleats well. I think that this skirt would also look really nice in a softer fabric with softer pleats or even with a chiffon or tulle upper layer. I'll definitely be making this again, maybe in something a little subtler fabric wise though. What do you think? I'd love to hear your views, so come and share. What should I Make with my slinky fabric? Tutorial: Sewing a lining into a sleeveless dress. Dying for a new lease of life - how to dye leather shoes. Claire Cooper - Artist, Designer & Educator. Simple theme. Powered by Blogger.